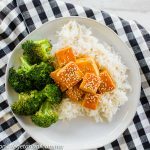 Honey Sriracha Tofu is a delicious spicy fried tofu recipe topped off with a sweet and spicy Sriracha sauce. This easy tofu recipe is a winner for game day! Using your tofu press, press the tofu for 10-15 minutes. Then cut into chunks. In a bowl mix together the honey, Sriracha, coconut aminos, sesame seed oil and rice vinegar. Whisk together, set aside. Heat oil (1T) in a frying pan over medium heat. Fry tofu until golden brown. This usually takes a 3-4 minutes per side. Pour whisked sauce into the skillet with tofu. Let sauce come to a boil and cook with tofu. Sauce will not thicken much. If using rice, divide among 4 plates. Top the rice with tofu and spoon additional sauce on tofu if needed. Top with sesame seeds! Love Broccoli? This dish pairs well with our Air Fryer Broccoli!